After offering three freerolls over the weekend, Juicy Stakes Poker is at it again with a trio of similar mid-week competitions offering a total of $1,750 in cash. 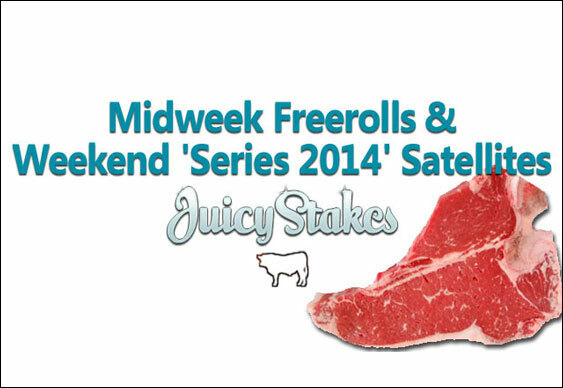 The first of the mid-week freerolls at Juicy Stakes Poker will take place on Tuesday evening offering $750 in cash followed by a pair of $500 competitions on Wednesday and Thursday. “Players can register for these and other daily tournaments by clicking on the Tournaments tab in the poker software,” read a statement from Juicy Stakes Poker. There is also another chance at the weekend to win money for a seat into the upcoming World Series Of Poker (WSOP) via the Series 2014 promotion. Satellites into the domain’s $33 buy-in Sunday finals run every four hours until May 25 awarding a top weekly prize of $1,500 in cash to spend in Las Vegas or wherever. “Juicy Stakes Poker’s Texas hold‘em, Omaha and Omaha high-low tables are busy around-the-clock and our new no-waiting fast-fold tables are increasingly popular,” read the statement from Juicy Stakes Poker.